COOKE – E. Gladys, 95, of Liverpool, Queens County, passed away peacefully in Queens General Hospital, Liverpool, NS on Tuesday, March 12th, 2013. Born in Milton, Queens County, she was a daughter of the late Angus and Alberta (McCoombs) Manthorne. Gladys enjoyed working in flower gardens, doing puzzles and playing cards. She is survived by her daughter Nancy (Stuart) Wentzell of West Northfield, her son Emery (Dorothy) of British Columbia, her 6 grandchildren and 2 great-grandsons, her sisters Verna (Arthur) MacIntosh of Greenwood and Hazel of Sommerville, Mass. Her brother Sterling of Guelph, ON., as well as her good friend Marg Worth of Fredericton. She was predeceased by her son James, her sisters Amy Suttis, Irene Wentzell and Evelyn Manthorne and her brothers Bevan and Maurice. To Glady’s family just let you know that my thoughts are with you all at this sad and difficult time. Dear Nancy , Pleae accept our deepest sympathy on the passing of your Mom . .You are in our thoughts and prayers ..
Nancy: We were sorry to hear about your mother. Our thoughts and our prayers are with your family. So sorry to hear about your loss of your Mom. My thought are with all of you during this sad time. Rest in peace Aunt Gladys. So sorry for your loss. Thinking of you at this very sad and difficult time. So sorry to hear about your Gladys’ passing. Our thoughts and prayers are with you all . Dear Nancy, thinking of you and your family at this sad time. I know your mom was very special to you. We were so saddened to hear of your Moms passing,she was a very sweet,soft spoken lady.She will be missed terribly by everyone who knew her.Our thoughts are with you all at this time. Nancy and family,sorry to hear of the loss of your mom,Glady. Please accept my most sincere condolences in the loss of Gladys. God Bless you as you grieve her loss. No one can ever heal. No one can every steal. Our condolences on the passing of your mother. Nancy I was so sad when I heard of your Moms passing she is such a special lady have very fond memories of her and also I didn’t know about Jimmy until last week so sorry for both your losses. Sending a big hug to you. Sorry for your loss. Your Mom was a lovely lady. Our thoughts and prayers are with you. Sorry to hear about the loss of your mother and brother. Hoping that time will heal the pain and you can move forward in peace. We are thinking of you at this difficult time. 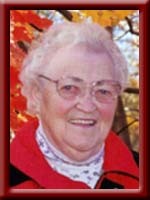 We all have wonderful memories of Aunt Gladys, her sense of humor, and kindness will always be remembered. We are thankful for the many family gatherings we shared with our much loved aunt and great aunt. My thoughts are with you at this sad time. Take care. Loving memories always of a pillar of the family who will always be remembered with respect and happy times. Never got to know my Grandmother as much as I would I liked to living on the other side of the country. My Grandmother had four granddaughters in British Coulmbia and with that came 8 Great Grandchildren for my grandmother…6 great granddaughters and 2 great grandsons. Sadly they will never get to meet her but I will take my memories of her and pass them on….my condolences to all her knew and loved her. May her soul rest in eternal peace. My condolences to the family. Sorry to hear of Mom’s passing. I’ll always remember the good times we had together. Now she and my husband, Jim, can rest in peace. Mom I will miss my phone call to you! I tried phoning the Hospital – but could not reach you! I am so sad to lose my Mother! I know that my brother, Jim will be there to greet you Mom! Rest in Peace! Rest In Paradise Grammie. Love always your Great Grand-Daughter.